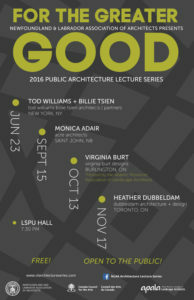 Virginia’s Next Speaking Engagement at NLAA, “For the Greater Good: Advocacy through Design”. Virginia Burt of Virginia Burt Designs will be speaking at an event on Friday October 13th 2016 presented by the Newfoundland & Labrador Association of Architects (NLAA) as part of their 2016 Public Lecture Series. The subject, “For the Greater Good: Advocacy through Design”. The event is hosted by The Atlantic Provinces Association of Landscape Architects (APALA) in St. John’s, Newfoundland. The Newfoundland and Labrador Association of Architects is a not-for-profit organization that promotes architecture and the profession within the province. APALA (Atlantic Provinces Association of Landscape Architects) is the professional association of landscape architects in Atlantic Canada and a component association of the Canadian Society of Landscape Architects.